Less than a month after the release of the Enyo 2.0 beta 2, beta numero 3 is now out, bringing bug fixes, core improvements, and some new user interface elements. The Onyx user interface style (heavily-influenced visually by but not code-based-on the Enyo 1.0 UI) has gain a new set of sliders and progress bars. There's the basic slider, which can come with or without a "this much" blue fill from zero. 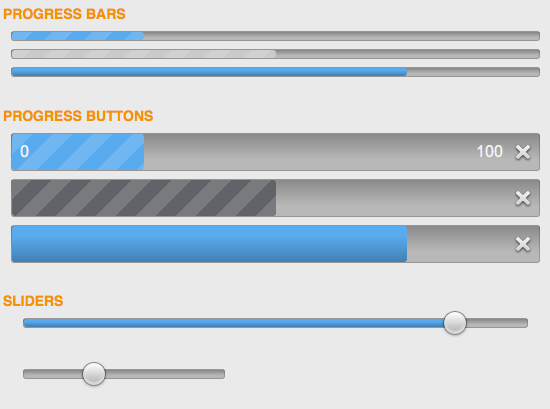 There are also two sets of progress meters - the standard progress bar, and a progress button. Both have the option of including stationary or moving diagonal stripes (the moving one making it seem like it's loading faster, or at least working when you've got a larger action to complete), or just a plain gradient. The progress buttons are taller vertically and include an X button to kill the action. As with the Enyo 2.0 beta 2, these UI widgets (and the framework as a whole) are fully open source and support all browsers, not just WebKit.